Find latest income tax slab rates in India for individuals, NRI, HUF,BOI,AOP,LLP, Local Authority, Co-operative society and company. But, before checking the slab rates. Let's first understand What is income tax slab in India? Please note: Rebate u/s 87A and Age-wise slab rate as discussed above in case of the resident individual are not available to Non-Residents. Please note: Rebate u/s 87A as discussed above in case of the resident individual are not available to HUF. Please note: Rebate u/s 87A as discussed above in case of the resident individual are not available to BOI. Please note: Rebate u/s 87A as discussed above in case of the resident individual are not available to AOP. Please note: Rebate u/s 87A as discussed above in case of the resident individual are not available to AJP. Please note: Rebate u/s 87A as discussed above in case of the resident individual are not available to LLP. Please note: Rebate u/s 87A as discussed above in case of the resident individual are not available to Indian Companies. Please note: Rebate u/s 87A as discussed above in case of the resident individual are not available to Foreign Company. Please note: Rebate u/s 87A as discussed above in case of the resident individual are not available to Cooperative Societies. Where Total Income exceeds Rs. 1 Cr - 15% surcharge on income tax above 1 Cr. Where Total Income exceeds Rs. 10 Cr - 12% surcharge. Where Total Income exceeds Rs. 10 Cr - 5% surcharge. Where Total Income exceeds Rs. 1 Cr - 12% surcharge on income tax above 1 Cr. HEC shall be added at 4% in all cases upon the income tax so calculated or Income tax + surcharge so calculated in cases of income above Rs. 50 lakhs. Note: The income chargeable to tax rate shall be after all admissible deductions. 1- No Tax on Taxable Annual Income up to Rs. 5 Lakh. The limit of Rebate u/s 87A has been increased from Rs.3.5 Lakhs to Rs.5 Lakhs. 2- Standard deduction increased from Rs 40,000 to Rs 50,000 for salaried class and pensioners. 3- No change in Income Tax slabs. 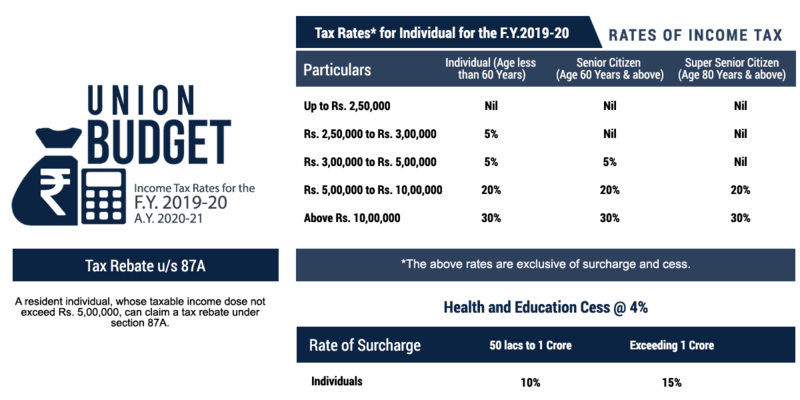 Calculate your tax liability Post Budget 2019 now! [FY 2018-19 Tax Payments vs FY 2019-20 Tax Payment] Use our Income Tax Calculator [Updated] now and see your tax saving! What are the Income Tax Slab for F.Y. 2016-17? What has changed in the Income Tax Slab in F.Y. 2018-19 in comparison to F.Y. 2017-18? What has changed in the Income Tax Slab in F.Y. 2017-18 in comparison to F.Y. 2016-17? I am salaried employee, which Income Tax Slab is applicable on me? How to calculate my Income Tax amount from the Income Tax Slab? The earlier cesses (Primary Education Cess and the Secondary and Higher Education Cess ) @ 3% have been replaced by the new cess namely health and education cess for AY 2018-19 @ 4%. Thereby increasing your tax outgo by 1 %.This rise in the cess is done for all categories of assessees (individual, HUF, Firm , company etc.). However, the increase in the tax liability can be further reduced by availing the benefit of Standard Deduction of Rs. 40,000 which has been reintroduced in F.Y 18-19. Standard Deduction has come in lieu of transport allowance and medical reimbursement. Note : In the above calculation, benefit of Rs. 34200 (Transport and Medical Reimbursement) has been provided in F.Y 17-18 and 40,000 standard deduction in F.Y. 18-19. A further relief has been provided to micro, small, and medium scale enterprises in Budget 2018. Companies with a turnover of less than Rs 250 crores in FY16-17 would be required to pay tax at 25 percent in FY18-19.However, all other companies shall pay the tax @ 30%. Where Total Income exceeds ? 1 Cr - 15% surcharge on income tax above 1 Cr. Where Total Income exceeds ? 10 Cr - 12% surcharge. Where Total Income exceeds ? 10 Cr - 5% surcharge. HEC shall be added at 4% in all cases upon the income tax so calculated or Income tax + surcharge so calculated in cases of income above ? 50 lakhs. Please note : Rebate u/s 87A and Age-wise slab rate as discussed above in case of resident individual are not available to Non-Residents. A firm /LLP is taxable at flat rate of 30 percent for the F.Y. 2017-18 (A.Y. 2018-19). For F.Y.2017-18( A.Y. 2018-19) the income tax slab for Indian Company. Mentioned below is the income tax rate for AY 2018-19 for companies. A foreign company is taxable at flat rate of 40 percent for the F.Y. 2017-18 ( A.Y. 2018-19). Local authorities are taxable at flat rate of 30 percent for the F.Y. 2017-18( A.Y. 2018-19). Education Cess(EC) : The amount of income-tax and the applicable surcharge, shall be further increased by education cess calculated at 2 percent of income tax and surcharge. Secondary & Higher Education Cess(SHEC) : The amount of income-tax and the applicable surcharge, shall be further increased by secondary and higher education cess calculated at 1 percent of income tax 2018-19 and surcharge. Rebate under Section 87A : Section 87A of the Act states that if a resident individual's total income does not exceed Rs. 3.5 lakhs then the individual will get benefit of rebate. The amount of rebate shall be 100% of income-tax or Rs. 2,500, whichever is less. Prior to the union budget 2017, it was on the taxable income up to INR 5 lakh and the benefit was of Rs. 5000/-. Income tax would be at a flat rate of 30 percent for the F.Y. 2016-17 (A.Y. 2017-18). A foreign company is taxable at flat rate of 40 percent for the F.Y. 2016-17 (A.Y. 2017-18). Secondary & Higher Education Cess(SHEC) : The amount of income-tax and the applicable surcharge, shall be further increased by secondary and higher education cess calculated at 1 percent of income tax and surcharge. Rebate under Section 87A : Section 87A of the Act states that if an individual's total income does not exceed Rs. 5 lakhs then the individual will get benefit of rebate. The amount of rebate shall be 100% of income-tax or Rs. 5,000, whichever is less. Cess - Secondary and Higher Education Cess has been replaced with Health and Education Cess. Further the cess rate Increased to 4% as compare to 3% in F.Y. 17-18. Income Tax Slab Reduced : New Tax slab rates for all resident individuals, NRIs, HUF, AOP, BOI and Artificial juridical persons reduced from 10% to 5%. Reduction in relief under section 87A : The rebate under section 87A reduced.In F.Y.2017-18, rebate of Rs.2,500 is available to resident individuals whose total income does not exceed Rs.3,50,000. Earlier,Section 87A provided a relief up to Rs.5,000 to a resident individual if his total income did not exceed Rs.5,00,000. Surcharge on income above Rs.50 lakhs : For F.Y. 2016-17 surcharge used to be there when income exceeded Rs.1 crore in case of an individual, HUF, AOP, BOI or artificial juridical person. For F.Y. 2017-18, the surcharge has become 10% on the income of individual exceeding 50 lakhs but less than 1 crore. For a salaried employee the income tax slab for individuals will be applicable.Choose the correct table according to your age.Please note there is no difference in the tax slab based on gender. Which income tax slab rates would be applicable if I am filing my Income Tax Return for F.Y. 2016-17? For calculating your income tax rate for F.Y. 2016-17, you need to check the Income Tax Slab for F.Y. 2016-17. Let us take example of Ms. Ruchi, age 29 years with an income of Rs.10,50,000, income tax deduction under section 80C Rs.150000 to understand how to calculate the income tax amount for F.Y 18-19. First we will check the applicable income tax slab, in her case the first slab for individuals less than 60 years would be applicable. Which ITR Form should I file for FY 2018-19 (AY 2019-20)? For the FY 2018-19 (AY 2019-20) the ITR forms notification has been issued by CBDT on 01 April 2019. For more details on ITR forms, their applicability and changes brought this Financial Year. Read here. Comparison between Tax Slabs of FY 2018-19(AY 2019-20) and FY 2017-18(18-19)? Which Finance Act applies to Financial Year 2018-19 or Assessment Year 2019-20? Finance Act 2018 is applicable to Financial Year 2018-19 or Assessment Year 2019-20. Which means for Income Tax returns to be filed till the due date of 31st July 2019 for the income earned between 1st April 2018 to 31st March 2019, Finance Act 2018 shall apply. While filing the return for FY 2018-19 (AY 2019-20) in July 2019, which income am I required to disclose? For the Financial Year 2018-19 (AY 2019-20) you are required to disclose income earned between 1st April 2018 to 31st March 2019. The current income tax slabs 2018-19 are for anyone filing their Income Tax Return in 2018 i.e. for F.Y.2017-18 (A.Y 2018-19). After reading this article, you must have understood that your ITR slab AY 2018-19 doesn’t just depend on your income. It also depends on your age , status and what all deductions and exemptions you have taken. Deductions and exemptions can knock you into a lower tax slab, reducing your tax liability (or increasing the size of your tax refund) in the process. That’s why it’s in your interest to make sure that you’re taking advantage of all the income tax provisions for which you’re eligible, whether you use tax preparation software, seek help from a CA or go the DIY route on Income Tax portal. Everything you Need to Know about Form 16 which is a basic document and a certificate of TDS deducted for every Salaried Person.